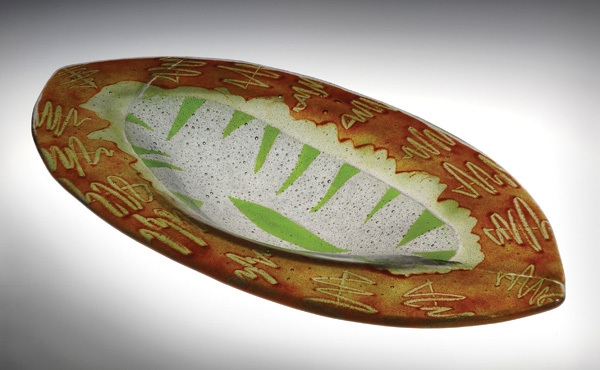 Downs, who creates her fused-glass tableware, jewelry, wall hangings, window hangings and tile in a 20-inch by 20-inch kiln, says that although she has basic ideas for what her pieces will look like, it’s the unexpected results that excite her. “Some colors combine with others and react in various ways because of the chemicals in the pigments,” she says. “Or bubbles will form. That’s a real surprise! I like to play with the colors and shapes, and this medium gives me the most inspiration.” An Illinois native who earned an art therapy degree from Trenton State College in New Jersey and a master’s degree in special education from the University of Illinois at Chicago, Downs divides her time between making her artwork and teaching special education at Portland State University. Downs’ tableware ranges from $20 for a 4-inch by 4-inch sushi dish to $250 for a large platter; her wall hangings cost between $50 and $350. Surf the Northwest costs $125. Call glass artist Christine Downs at 503-234-1624 or visit her website, christinedowns.com. You can see her work at Hollywood Wine & Espresso (4075 N.E. Sandy Blvd. ; 503-459-4081) in Portland, and at the SE Area ARTWalk (between 12th Ave. and 41st Ave. and between Hawthorne Blvd. and Powell Blvd. ; seportlandartwalk.com) in Portland on March 3 and 4.